Did you know that over 60% of Americans have trouble sleeping at least a few nights a week? We’re here to help you get the sleep you need! In celebration of our upcoming collaboration launching in April, we wanted to help you look forward to bedtime again. Say goodbye to restless nights and hello to waking up feeling refreshed and ready to take on the day. We’re excited to announce we’ve partnered with health and wellness brand Sagely Naturals with an exclusive sleeptime set. Created to help you relax into a peaceful state before sleep, this sleeptime set is the perfect upgrade to your current nighttime routine. 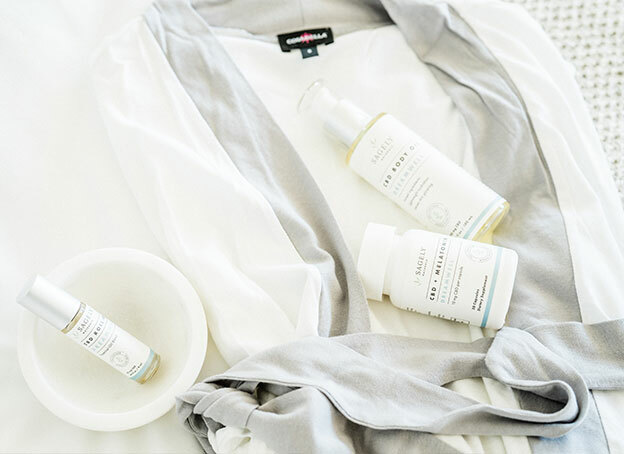 Our exclusive collaboration consists of our best-selling Cosabella robe and a new innovative CBD line from Sagely Naturals’ Dreamwell collection. With these items, you’ll finally get the good nights rest you deserve. Our Cosabella sleep robe is designed in luxurious 100% Pima cotton, promising ultimate comfort and coziness in this incredibly super soft fabric. While Sagely Naturals’ CBD line promotes balance through its interaction with the endocannabinoid system in our bodies, which plays a major role in our sleep-wake cycles. Sagely Naturals uses whole plant CBD oil derived from hemp grown in the U.S.; it is a natural, non-psychoactive compound promoting everyday balance, health and wellness – in the mind and body. Formulated with Roman Chamomile, Evening Primrose and CBD Oil, the Dreamwell Body Oil is lightweight, non-greasy and quick absorbing – perfect for applying right before bed. Our recommendation? Massage two pumps of this luxurious oil onto skin after a warm, steamy shower, then settle into your peaceful pre-sleep routine in our Cosabella sleep robe. We created our Dreamwell collection for those who are ready to look forward to bedtime again. Sagely Naturals Dreamwell Body Oil is a luxurious and peaceful nighttime ritual. It contains an aromatic blend of soothing essential oils and scents – featuring top notes of geranium, lavender, and spring meadow, middle notes of vintage rose, chamomile, and palm leaf, and base notes of blonde woods and elderflower. It’s lightweight, non-greasy, and quick absorbing–perfect for applying right before bed. It’s time to dream well again with Cosabella x Sagely Naturals! Available for a limited time only, shop the Cosabella x Sagely Naturals collection now.